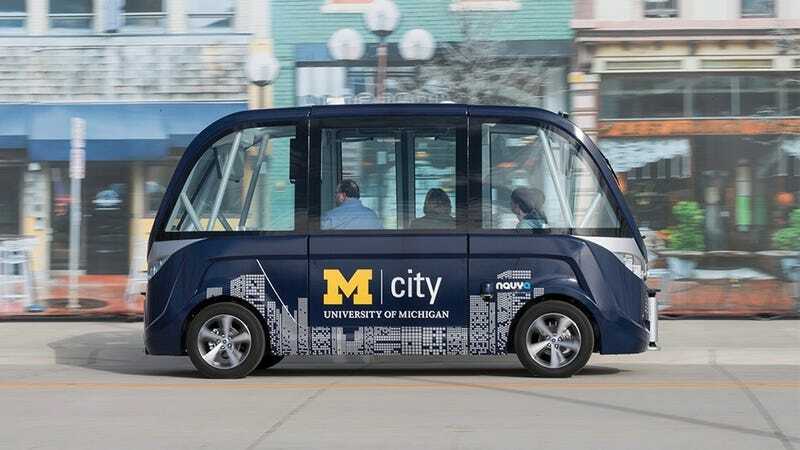 Students at the University of Michigan this fall will be the first ever to go to a school with a driverless bus system. Two fully autonomous, 15-passenger electric shuttles will take students back and forth on the school’s North campus beginning this fall. The shuttles are manufactured by France-based automaker NAVYA, which uses state of the art multi-sensor tech, including LIDAR sensors and Odometers, in its fleet of level 5 autonomous busses. The shuttle service currently only reaches speeds of 28 mph and covers just one route every 10 minutes. It would run on University roads during business hours without cost to riders, although the University plans to increase hours of operation and the ground covered depending on the service’s efficiency. The shuttle service is in partnership with Mcity, a fake-city used for testing driverless cars created in 2015 in partnership with stakeholders from the public and private sector alike. The service is the first-ever automated shuttle service on a campus, according to Huei Peng, director of Mcity and mechanical engineering professor at the University. “The shuttles will augment U-M’s busy campus bus service to provide another mobility option,” Peng said in a release. NAVYA announced only a few days ago that it would establish its first U.S. assembly plant in the Ann Arbor area, in partnership with the University. The French automaker currently has shuttles all over the world, including in France, Australia and Las Vegas. “The Ann Arbor area offers a lot of possibilities for NAVYA to work with our suppliers and hire high-level professionals,” said Henri Coron, Vice President of Sales at NAVYA, in a release. Michigan legislators have been working relentlessly to ensure it remains the hotbed of auto innovation it once was. The state recently committed to nation’s most lax driverless car laws to allow for testing and sale of these vehicles to flourish. Junior Senator from Michigan Gary Peters said his state is “leading the way” in autonomous vehicle technology. “When we think about that history, it’s interesting to think that in the beginning of the 20th century it was the automobile that really propelled incredible innovation in this economy, and again in the 21st century it’s gonna be the automobile that moves innovation forward,” Peters said at a recent congressional hearing on the topic. Driverless busses taking hungover college kids to engineering classes may be a key step in the lifecycle of this kind of innovation.